We are holding a vibratory pattern in the liquid crystals of our water. Thru inspired sounds capsules, participants will embark on a sound journey that will set off their mind into different spaces of awareness. Zoel is the CO - Creator of THE MOVE-MENT. She has an established career as DJ, music artist and former MTV VJ; well known for her captivating music, exciting stage presence and unique style. 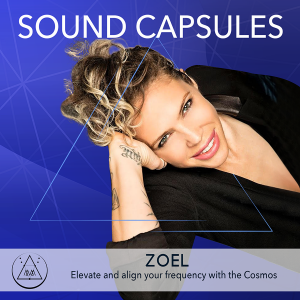 Zoel is currently in the studio producing her upcoming album combining the beats of Deep House and the vibrations of Healing Sounds form around the world. Born in Argentina, but calling the US home for many years, Zoel is fluent in Spanish and English and travels extensively for clients and projects throughout the world. Zoel has appeared in various international publications including, Vogue, Ocean Drive, Flaunt, ELLE, Mademoiselle, Seventeen Magazine, Rolling Stones Argentina,etc. Zoel’s Motto is to encourage people to dance their way into HAPPINESS.